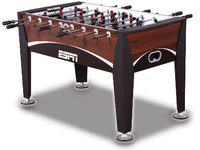 The Sportcraft ESPN striker is an average quality table made by the Sportcraft manufacturer. 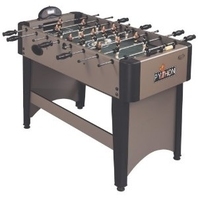 The ESPN striker is a full size table that did not receive rave reviews due to the lack of quality parts when compared to tournament style foosball tables like Tornado or Dynamo brands. Branded logo tables, like ESPN, are typically higher priced than the value of the parts due to the logos and the design work that goes into them. 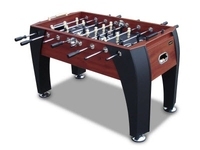 The truth is, the striker Sportcraft table lacks some very important features we look for in order to receive positive reviews. 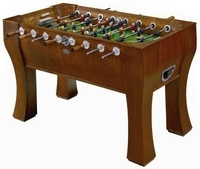 The main pitfall of this table are the robot style foosball men that do not accommodate for advanced ball control to perform foosball shots at a high level. These men have more of a rounded toe than the Tornado men. 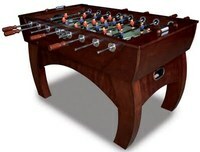 One nice foosball part that does come on this table are the adjustable leg levelers. 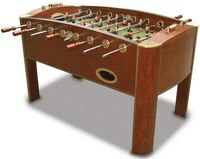 This foosball table is priced at around $315 US.